Therefore, by SAS condition, ΔADB ≅ ΔADC. Therefore, by SAS condition, ΔABC≅ ΔPQR. 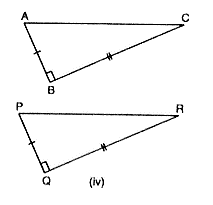 State the condition by which the following pairs of triangles are congruent. 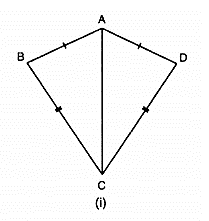 In figure, line segments AB and CD bisect each other at O. Which of the following statements is true? State the three pairs of matching parts, you have used to arrive at the answer. 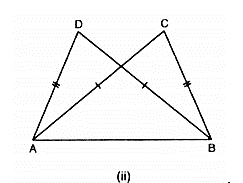 Line-segments AB and CD bisect each other at O. AC and BD are joined forming triangles AOC and BOD. State the three equality relations between the parts of the two triangles that are given or otherwise known. Are the two triangles congruent? State in symbolic form, which congruence condition do you use? We have AO = OB and CO = OD since AB and CD bisect each other at 0. Also ∠AOC = ∠BOD since they are opposite angles on the same vertex. 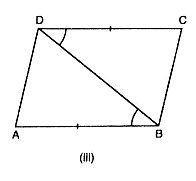 ΔABC is isosceles with AB = AC. 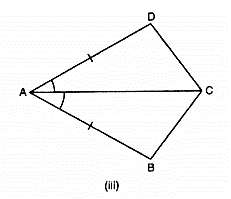 Line segment AD bisects ∠A and meets the base BC in D.
(i) Is ΔADB ≅ ΔADC? (ii) State the three pairs of matching parts used to answer (i). (iii) Is it true to say that BD = DC? (ii) We have used AB, AC; ∠BAD = ∠CAD; AD, DA. 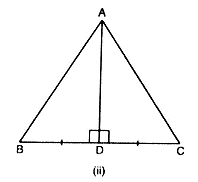 (iii) Now, ΔABD≅ΔACD therefore by c.p.c.t BD = DC. In Figure, AB = AD and ∠BAC = ∠DAC. (i) State in symbolic form the congruence of two triangles ABC and ADC that is true. In figure, AB || DC and AB = DC. (i) Is ΔACD ≅ ΔCAB? 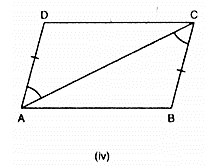 (iii) Which angle is equal to ∠CAD ? (iv) Does it follow from (iii) that AD || BC? (ii) We have used AB = DC, AC = CA and ∠DCA = ∠BAC. 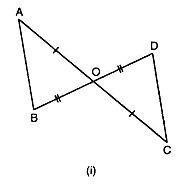 (iii) ∠CAD = ∠ACB since the two triangles are congruent.